After releasing an EP in 2010, only a year after their formation, the Netherlands based BODYFARM had a lot to prove. The self-titled EP was a tribute to old school 1990's Death Metal, however it wasn't very inventive and the production quality was less than impressive. The Dutchmen made a significant improvement with their new CD, titled "Malevolence". 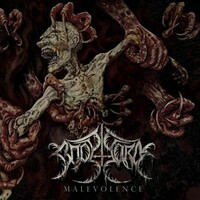 "Malevolence" is full of punishing riffs and neck snapping tempo. These four men do a great job of staying true to the established old school Death Metal sound, while adding flavor that is all their own. In nearly every song, the listener will hear Thrash mutes mixed with double bass. The solo work is delightful and features plenty of tremolos, giving it a very unique Sind that is sure to please. BODYFARM also makes a point to nit hide behind their distortion, which is very refreshing. The lyrics are great topics for any death metal fan: hate, Death, war and anti-war extremity. This leads me to believe them to be influenced by BOLT THROWER or even SLAYER. This mutual theme is most heavily noted in songs such add "Demons Of The Cross", "Tombstone Crusher" and "I Am The War". The very last song on the CD, "Cryptic Realms" is a MASSACRE cover and even features Kam Lee on vocals! This track is especially memorable, and is even more so for any fan of covers. Overall, I was very pleased with "Malevolence" in its entirety. There was not a single adding that I didn't enjoy and the band sounds very mature in all areas. I would recommend this CD to any Death fan and I think it could be a stepping stone for any metal fan to stay listening to Death Metal, seeing as the vocals are easy to decipher. BODYFARM still has dime growing to do but they've made major progress in just two years, imagine what they can do on the next five!